It's been over 2-1/2 years since the Richmond, Virginia-based quintet Lamb of God released their last album, Wrath. Now, to the delight of metal fans everywhere, the band has announced that their new album, Resolution, will be out on January 24, 2012. The album, recorded in Virginia and New York and produced by Josh Wilbur, features 14 songs and will come in a deluxe softpak with artwork by longtime art director Ken Adams. A complete track listing for Resolution can be found below, followed by a brand-new teaser video for the album. You can pre-order Resolution at the official Lamb of God web site. On November 15th, the band will announce the first leg of what will be a two-year world tour. Johnny Guitar is back! John 5 today unveiled the video for "Welcome to Violence," the second single from his upcoming CD/DVD release God Told Me To. "Welcome to Violence" is just over four minutes of asylum escapees armed with chainsaws driving a locomotive down Main St., USA, with Johnny 5 shredding faster than Freddy Krueger on a Cuisinart. Essentially, it's everything we love and enjoy about John. The third single, "Noche Acosador," will be released on November 1st. The song is "unlike anything you've heard from me before," says John at his web site. Legendary Aussie guitarist Tommy Emmanuel (CGP) is set to release his first ever album of holiday music, All I Want For Christmas (Favored Nations Entertainment). Emmanuel, honored as the CMA's Global Artist this year, co-produced the album with veteran Nashville picker/arranger John Knowles, CGP. The pair collaborated on new arrangements for nine Yuletide classics including "I'll Be Home For Christmas," "The Christmas Song," and "Rudolph The Red-Nosed Reindeer." Emmanuel also wrote one original for the collection – "One Christmas Night" – and arranged a second new composition, "The Magic Of Christmas Time," by Rick Price, who plays piano on the song. "People have asked me about doing a Christmas album so many times over the last 20 years," says Emmanuel. "When I had time to really get into this project, it just had a life of its own, and was so easy to make because we all loved the music so much. It's exciting that there will be so many fans happy about it coming out." Most of the arrangements for All I Want For Christmas came together via Skype, while Emmanuel was on tour internationally, and Knowles – who also plays guitar on the album – was home in Nashville prepping. Emmanuel employed several guitars for the sessions, relying heaving on a new David Taylor model that he says, "has a singing quality to it, a beautiful voice." Everything was recorded at Beech Creek Studios in Franklin, TN with Kim Person, who has produced Emmanuel's last five albums. To learn more, visit TommyEmmanuel.com. Just in time to celebrate Halloween, here are the top 5 of our 10 favorite heavy metal horror heroes of the past four decades. To check out numbers 6 through 10, click here. For official guitar tab, video lessons, and jam tracks, click on the artist name. Think their name is scary? You should see their song titles and lyrics. The macabre spawn of Marilyn Monroe and Charles Manson, Marilyn rewrote the heavy metal horror book in the late '90s, much to the ire of suburban parents everywhere. He's not only one of the scariest heavy metal artists on this list, he's also the genre's top horror filmmaker. With perhaps the greatest live rock 'n' roll show in history, KISS set the heavy metal theater standard, led by bassist Gene Simmons's blood-spitting gag. While his early '70s act is tame by today's standards, Alice is the originator of the heavy metal horror genre, and, uh ... We're not worthy! We're not worthy! Just in time to celebrate Halloween, here are 10 of our favorite heavy metal horror heroes of the past four decades. Numbers 10 to 6 are here. For the top five, click here. For official guitar tab, video lessons, and jam tracks, click on the artist name. Finland's version of KISS ... times 10! 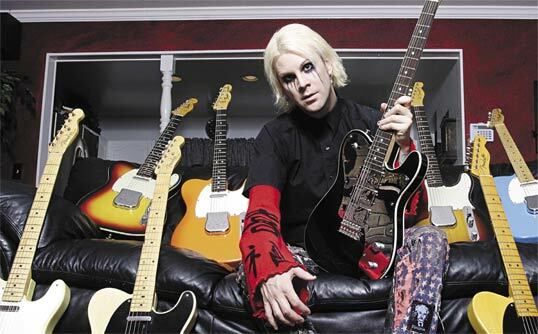 As the main riff man for Rob Zombie and also a Manson alumnus, John 5 is drawn to horror metal like maggots to a ... well, you get the picture. Sure, the masks and makeup are the things of nightmares, but the scariest thing about Slipknot is just how musically talented this nonet is. To view numbers 5 through 1 and see who tops our list, click here! According to a report at The Hollywood Reporter, Poison, along with Capitol Records and EMI Music, is being sued for copyright infringement on two songs from their 1986 debut Look What the Cat Dragged In. Billy McCarthy and James Stonich, of the now defunct Chicago, Illinois-based rock group Kid Rocker, have alleged that when guitarist C.C. 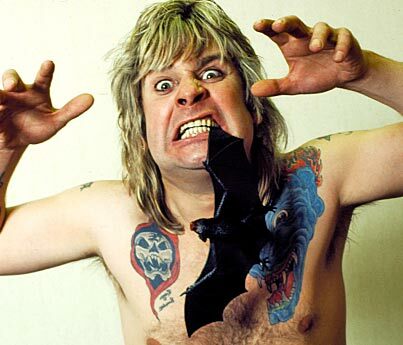 DeVille auditioned for the group in 1984, he was given some of the band's studio tapes, and that portions of the songs on those tapes were subsequently incorporated into the Poison songs "Talk Dirty to Me" and "I Won't Forget You." McCarthy and Stonich are demanding profits from those two songs along with statutory damages and an injunction to prevent Poison from performing the songs. If you're wondering, like I am, why they waited 25 years to pursue legal action, well, the pair's attorney, Daniel Voelker, has an answer for you: "That's a good question." Really? That's it? I'll be putting my money on the Aqua Net All-Stars on this one. When Lynyrd Skynyrd sang of "Sweet Home Alabama," I don't think this is quite what they had in mind. A 55,000 square-foot mansion in Shoal Creek, Alabama, currently on the market for anyone with $17.9 million burning a hole in their overalls, prominently features guitar-shaped landscaping as one of its many charms. Surprisingly, the home's current owner is neither a guitar player nor a collector, but rather the former CEO of a physician management company (yet another vain example of CEO compensation gone wild). In addition to the guitar-shaped driveway and formal garden, the home features 15 bedrooms, 22 bathrooms, a 13-car temperature-controlled garage, a 25-seat home theater, a full-sized commercial elevator, and a 2,000-bottle wine cellar. It sits on 27 acres with equestrian trails, four pastures, indoor and outdoor arenas, and a six-stall barn with attached living quarters. Surely, you could also carve a nice recording studio space out of those 55K square feet, and just think of all the gear storage! To take a look inside this dream space, click here.